Total Gym empowers users with bodyweight-based equipment to go beyond rehab and succeed in their fitness goals. 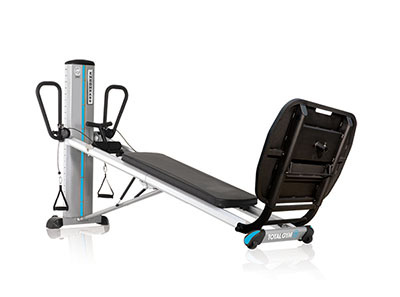 The ELEVATE Encompass is a functional training system that provides a full body workout in one easy-to-use machine. Users work multiple muscle groups together for a complete workout that challenges proprioception and core stabilizers by integrating multi-plane movement and unrestricted range of motion in nearly every exercise. The ELEVATE Encompass works on an incline against gravity to strengthen the way the body executes daily physical activities. This allows training to be more productive and functional using one's own bodyweight as resistance. Dip bars are installed and are standard on this unit. 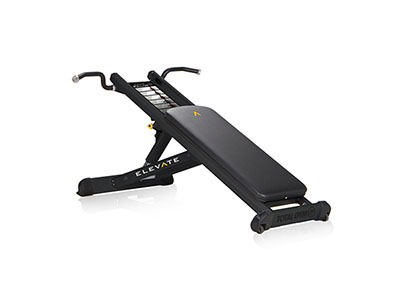 Dimensions: 107" x 69" x 38"
The ELEVATE Circuit is designed to be simple, intuitive and challenging for all fitness levels. 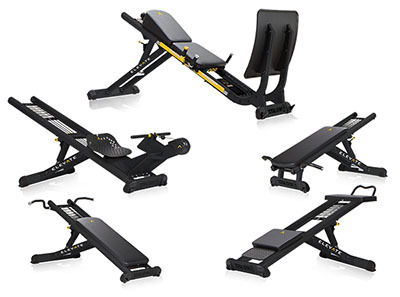 This 5-piece commercial gym equipment package applies the unique concept of incline bodyweight training as the method of resistance, rather than the traditional weighted resistance most fitness equipment is built upon. It features over 80 exercises and is one of the most premier gym equipment packages designed to keep users performing at the peak of their game. The ELEVATE Circuit can be placed on the gym floor as a dedicated strength circuit for users or used within a group setting as a circuit-style class workout or boot camp station. 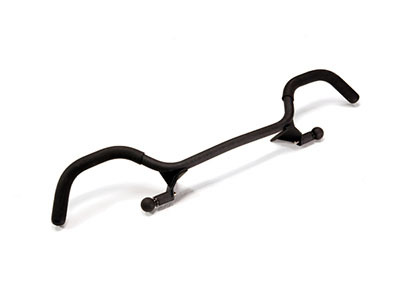 The Circuit comes in a matte black finish and offers 7 incremental resistance levels for a more challenging workout. 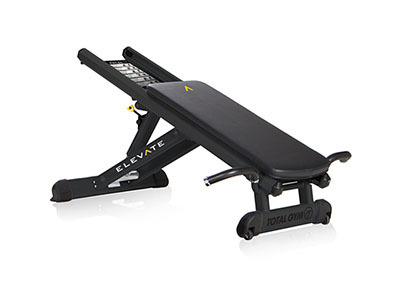 Includes: ELEVATE Row ADJ, ELEVATE Core ADJ, ELEVATE Jump, ELEVATE Press and ELEVATE Pull-Up. Dimensions: 98" x 30" x 23.5"
Add the Strength Package to your ELEVATE Encompass machine to add additional strength training exercises to help develop increased muscle mass, tone and definition. 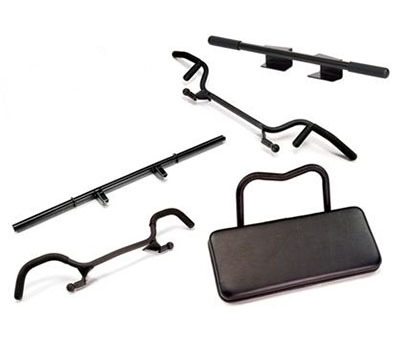 The Strength Package comes with 5 accessories which includes the Press Bar, Squat Handle Bar, Weight Bar, SCRUNCH Accessory and 3Grip Pull-up Bar. Dimensions: 70" x 44" x 45"
Add the full functionality of Pilates to your ELEVATE Encompass machine with the comprehensive Pilates Accessory Package. Pilates movements increase reach, flexibility and core control with low joint compression. The physical and mental benefits of traditional and evolved Pilates add balance to any fitness program. The Pilates Package comes with 4 accessories which includes the Telescoping Toe Bar, Standing Platform, Slide Distance Regulator and Leg Pulley System. The ELEVATE Pull Up is built on an adjustable incline allowing users to select a percentage of their own bodyweight to pull. With seven incline levels to select from, this unique station rivals most lat machines by allowing users to lift anywhere from 35 percent to 65 percent of their own bodyweight. The incline design also permits anyone to do a plyometric or one-arm pull-up and engages all the muscles of the upper body to efficiently and effectively enhance muscle definition and improve overall strength. The ELEVATE Press is a commercial shoulder press machine that introduces an entirely new way to do a shoulder press. 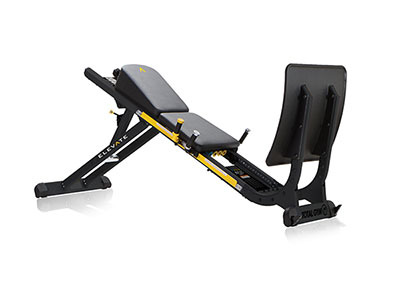 The ELEVATE Press places users in an inverted position, unloading the lower back and reducing spinal compression. Seven adjustable levels allow users to select a percentage of their own bodyweight as resistance, while the unique closed chain design reduces shoulder impingement that users typically feel using traditional shoulder press gym equipment and stabilizes the shoulder girdle for safe and effective upper body strengthening. 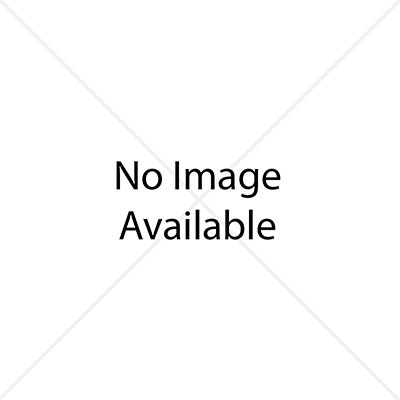 Users are also provided with a mechanism for performing a decline push-up. Dimensions: 66" x 41" x 39"
The ELEVATE Jump is an exercise machine that builds explosive power and develops lower body muscle mass with two primary movements, the squat and the squat jump. It is uniquely designed to facilitate plyometric jumping exercises leveraging both linear bodyweight resistance and variable band resistance. 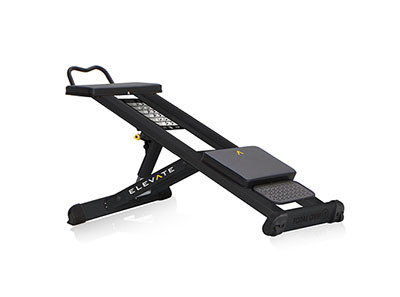 The ELEVATE Jump produces both concentric and eccentric loading of the muscles allowing users to accelerate and decelerate quickly during a squat jump in a safe, controlled manner. It can accommodate all levels of fitness and supports the spine during traditional squat exercises. Users can comfortably control the descending and ascending phases of a squat or jump while also providing an opportunity for advanced variations. Dimensions: 104" x 68" x 33"
The ELEVATE Core ADJ is a unique piece of core exercise equipment that strengthens the abdominal muscles, while engaging the entire core musculature. This versatile abdominal exercise equipment is simple, intuitive and accommodating of all fitness levels. It features 7 levels of adjustable resistance to help enhance basic core stability for beginners while providing advanced strengthening and a competitive edge for the most seasoned athlete. The ELEVATE Row is a rower that emulates a rowing movement on an incline to produce a full body workout. 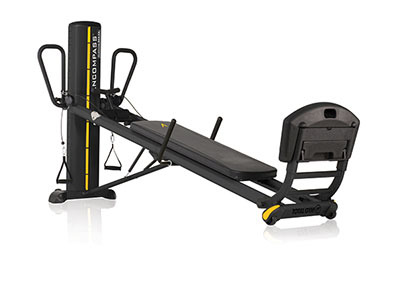 Using adjustable bodyweight resistance, it integrates a strength component into a traditional cardio machine. Simple and fun to use, the ELEVATE Row targets all the muscles groups simultaneously and enables a smooth consistent load through the entire range of motion. The ELEVATE Row folds upright for easy storage and is designed for multi-planar movement. It includes exercises such as biceps curls and an alternating side-to-side row. 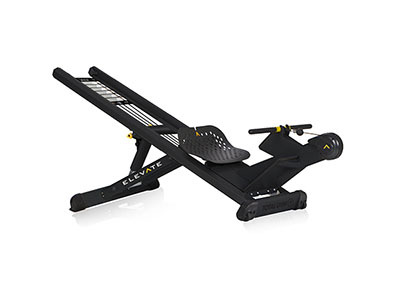 The ELEVATE Row ADJ is a rower that emulates a rowing movement on an incline to produce a full body workout. 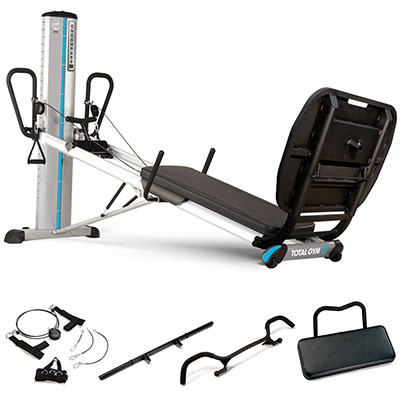 It features seven levels of adjustable bodyweight resistance to integrate an adjustable strength component into a traditional cardio machine. Simple and fun to use, the ELEVATE Row ADJ targets all the muscles groups simultaneously and enables a smooth consistent load through the entire range of motion. The ELEVATE Row ADJ is designed for multi-planar movement and includes exercises such as biceps curls and an alternating side-to-side row. The Encompass PowerTower is commercially designed and manufactured for the rehabilitation clinics. It features an adjustable glide board for high-performance sports-specific conditioning, athletic training and rehabilitation. 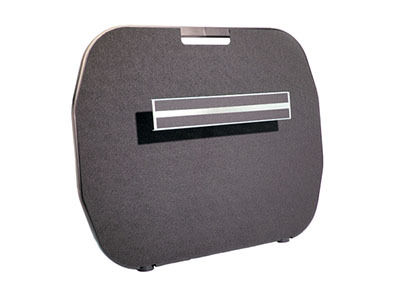 The remote-control handles allow touch-control level adjustments when exercising. The PowerTower can load a range of bodyweight from 1% to 72% and allows for motorized incremental load changes during exercise at the push of a button. It comes standard with the Closed Chain Platform, BAPS Adapter, Retractable Dip Bars, Squat Handle Bar and Slide Distance Regulator. 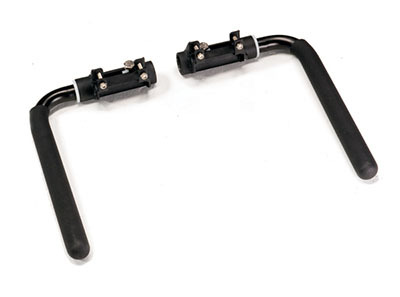 The complete package adds the Press Bar, Weight Bar, SCRUNCH and Leg Pulley System. Dimensions: 107" x 78" x 38"
The Encompass PowerTower is commercially designed and manufactured for the rehabilitation clinics. It features an adjustable glide board for high-performance sports-specific conditioning, athletic training and rehabilitation. The remote-control handles allow touch-control level adjustments when exercising. The PowerTower can load a range of bodyweight from 1% to 72% and allows for motorized incremental load changes during exercise at the push of a button. It comes standard with the Closed Chain Platform, BAPS Adapter, Retractable Dip Bars, Squat Handle Bar and Slide Distance Regulator. The Encompass recreates and strengthens the way the body executes daily physical activities and stores those functions in the muscle memory. This allows the patient to recover more productively and more functionally using their own bodyweight as resistance. The result is a full body conditioning though the fitness continuum from early post-injury to high performance training. The Encompass allows clinicians to build injury-specific treatment protocols and training modalities that can accelerate successful patient outcomes for a variety of demands. It comes standard with the Closed Chain Platform, BAPS Adapter, Retractable Dip Bars, Squat Handle Bar and Slide Distance Regulator. 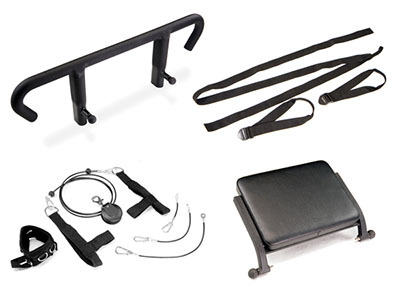 The complete package adds the Press Bar, Weight Bar, SCRUNCH and Leg Pulley System. The Encompass recreates and strengthens the way the body executes daily physical activities and stores those functions in the muscle memory. This allows the patient to recover more productively and more functionally using their own bodyweight as resistance. The result is a full body conditioning though the fitness continuum from early post-injury to high performance training. The Encompass allows clinicians to build injury-specific treatment protocols and training modalities that can accelerate successful patient outcomes for a variety of demands. It comes standard with the Closed Chain Platform, BAPS Adapter, Retractable Dip Bars, Squat Handle Bar and Slide Distance Regulator. 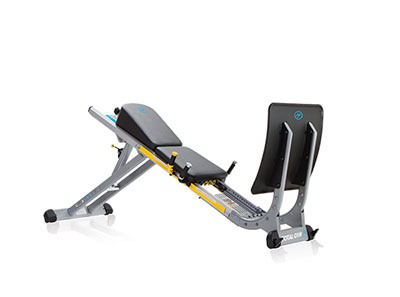 The LEX is a lower extremity machine that supports the spine during traditional squat exercises. It comfortably controls the descending and ascending phases of a squat or jump, while also providing an opportunity for advanced variations. This allows for a faster recovery of the lower extremity in a safe and progressive manner. Users work with a percentage of their own bodyweight to perform a squat or a jump, leveraging both linear bodyweight resistance and variable band resistance. The Row ADJ is a rower that provides a moderate-to-vigorous intensity aerobic workout, while sparing the joints, the high-impact ground-reaction forces associated with running and jogging. It emulates a rowing movement on an incline to bring the need for more strength to the movement. Simple and fun to use, the Row ADJ targets all the muscles groups simultaneously and enables a smooth consistent load through the entire range of motion. The Row ADJ is designed for multi-planar movement and includes exercises such as biceps curls and an alternating side-to-side row. The Leg Pulley System is an accessory that enables users to perform a full complement of cable-based leg exercises such as resistance training and Pilates. The pulley system allows for unilateral and bilateral movement with multiple leg attachments. 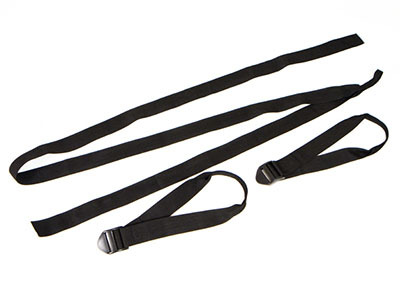 A pair of foot harnesses facilitate traditional single leg cable exercises for inner and outer thighs. 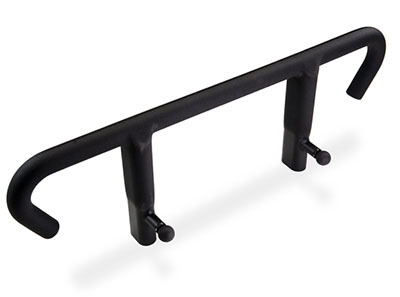 The 3 Grip Pull-Up Bar accessory easily attaches to the top of the rails, allowing users to work with a percentage of their own bodyweight. The pull-up bar facilitates pull-ups in three different grip positions for maximum variability. 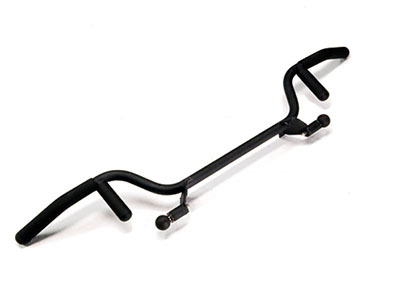 The 3 Grip Pull-up Bar lets you put the focus where you want it by choosing from 3 grips: wide, narrow and hammer. Use this pull-up bar on the upper back, biceps, lats or any other combination. Dimensions: 45" x 7" x 6"
The Press Bar attachment allows users to perform military press or shoulder press with both wide and narrow ergonomic grips to target the upper back, shoulders and triceps. 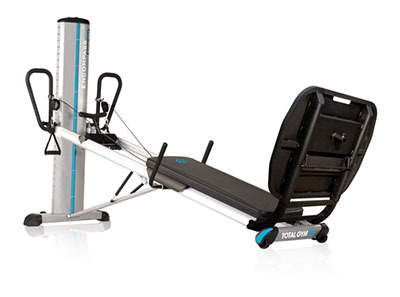 The Press Bar attaches to the bottom rails of the Total Gym incline trainer providing a unique option for inverted press exercises. The inverted design allows users to unload their spine when performing press exercises and opens the shoulder joint to decrease shoulder impingement during movement. Dimensions: 38" x 6" x 5"
The Scrunch Accessory facilitates simple to advanced progression of abdominal workouts that lengthen and sculpt abdominals and oblique muscles. Differing from other ab crunch equipment, the Scrunch Accessory supports proper posture, stabilizes the upper body and engages the entire core musculature for a strong, lean mid-section. The unique positioning of this accessory enables closed-chain exercises that fortify muscles and bones. Perfect for any fitness level, user’s legs drive abdominals in every Scrunch for overall function and correct biomechanics. 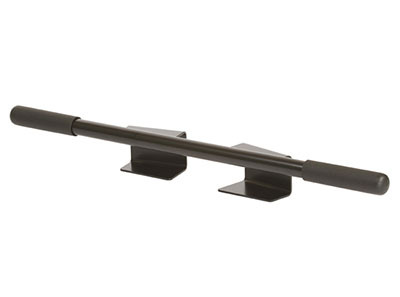 Dimensions: 24" x 11" x 16"
Telescoping Toe Bar facilitates many beginning, intermediate, and advanced Pilates movements. Like traditional Pilates reformer equipment, the Telescoping Toe Bar facilitates upper body, lower body, torso stretching and strengthening. The Toe Bar is a standard Pilates reformer accessory for the complete reformer repertoire. 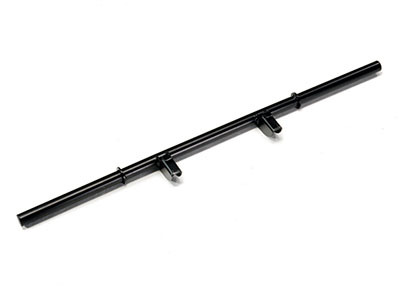 Dimensions: 40" x 7" x 14"
Retractable dip bars are uniquely designed adjustable dip bars that rotates up for use, then rotates down and retracts inward to store parallel to the rails for maximum space efficiency. It allows users to do dip exercises to target the triceps and pectorals for strength and conditioning. Dimensions: 17" x 4" x 10"
The Standing Platform facilitates proper body alignment during Pilates and other exercises while it provides dynamic instability toward improving balance, flexibility and coordination. Attached to the base of Total Gym rails, users can place one foot on the platform and the other on the rolling glideboard. 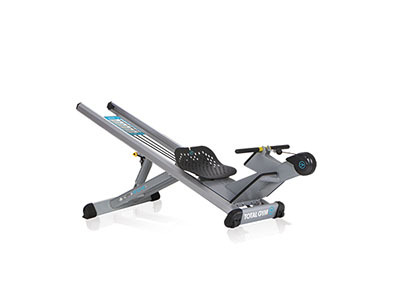 Doubly functional as a Pilates platform, users can use the Standing Platform in combination with the Slide Distance Regulator to limit the rolling distance of the glideboard for front and side lunges. 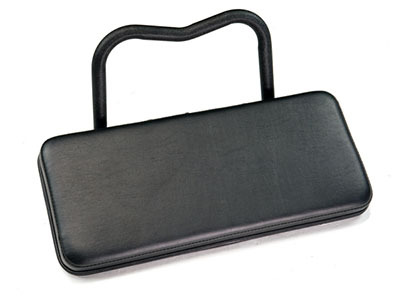 Dimensions: 23" x 7" x 16"
Take your Total Gym workouts to the next level with the weight bar accessory. The weight bar adds increased resistance to your exercise program by allowing for the addition of plate weights to the glideboard. Weights are not included. Dimensions: 35" x 3" x 4"
The Closed Chain Platform facilitates several lower body exercises, including loaded and unloaded squats and calf raises. It is ideal in the physical therapy setting and can also be used in combination with other products. This functional training platform can safely and gradually challenge balance and mobility. The closed chain platform also allows for a wide variety of foot patterning and positions that facilitate progressive training of movements for speed and agility. 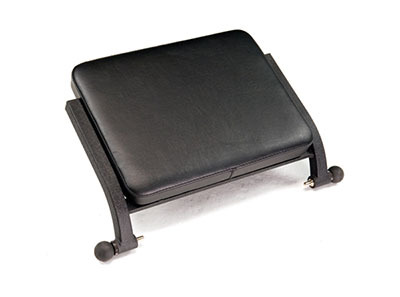 Dimensions: 26" x 6" x 31"
The BAPS Adaptor provides an attachment point for Biomechanical Ankle Platform System (BAPS board) to allow controlled rehab and conditioning. 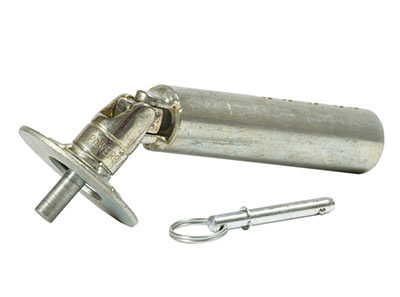 This adapter allows for accurate, calibrated and predictable stress on the lower leg, ankle and foot. Appropriate for rehab as well as for functional assessments, pre-activity screenings and conditioning programs. The Closed Chain Platform is required for BAPS Adaptor use. Dimensions: 7" x 5" x 5"
The Deluxe Slide Distance Regulator provides control and safety by enabling you to set the rolling distance of the glideboard. Users can lock the glideboard in place to assist with mounting, dismounting and positioning. Users can also customize the rolling distance of the glideboard based on strength and mobility limitations. This is especially applicable in physical therapy for post-surgical range of motion training and restrictions. Dimensions: 13" x 3" x 3"
The Squat Handle Bar provides increased stability and control of the glideboard during weighted squats by utilizing the Weight Bar attachment. When used in a physical therapy setting, the Squat Handle Bar also allows patients to self-stabilize. Dimensions: 27" x 4" x 5"
The LAT Bar Upgrade Kit adds the Lat bar accessory to help develop increased muscle mass, tone and definition. The Cable Extension Kit adds extra extension cables to lengthen existing cables.